What I'm excited about this February: downhill skiing, brisk Saturday mornings at the market, and getting one step closer to planting a veggie garden this spring! I recognize Valentine's Day also falls in the calendar – but for some reason, Valentine's doesn't do much for me. Besides the excuse to eat copious amounts of chocolate, the rest of it is something I'd prefer to opt-out of. Like going to a restaurant on the second-busiest day of the year. Or feeling pressured to buy cheesy gifts and overpriced greeting cards (why do they all sound so awkward?). And just being stressed out in general because well it’s, Valentine's day. I like affection (and chocolate), year-round, thank you! On a positive note, V Day does mean plenty of dark chocolate for sale on the 15th. That's my kind of party. But if you like to do-it-up on Valentine's day – all the power to ya – I'll be sure to send extra love (and discount chocolates) your way! That said, I was tempted to have some fun this year - in the form of pink milk! Nut milk, to be exact. And only slightly pink, because I'm subtle like that. After trying some flavored nut milk at our weekly farmer's market trip, I was excited to make my own at home. And boy, let me tell you: flavored nut milks are where it's at! I make nut milk regularly, but I'd never ventured away from my vanilla + date combo until a few weeks ago. Trust me, I've been making up for lost time since! After discovering this Rose & Honey Almond Milk, our jars of almonds have all but disappeared. The combination of rose and honey is a match made in heaven – they combine to make a slightly sweet, ever-so-slightly floral nut milk that goes down smooth. Seriously addictive. And despite sounding fancy, you'll be surprised by how easy it is to make. This recipe starts off as many nut milk recipes do, with a bath. Soaking your almonds will allow them to soften, and also makes them easier to digest. By soaking nuts in advance, you help release their phytic acid – which is excellent news because phytic acid can interfere with your absorption of other vitamins and minerals (hence why it's often referred to as an "anti-nutrient"). There's so many beneficial nutrients in nuts that I find soaking a small compromise for significant health (and even taste) benefits. Plus, almonds look a lot more delicious after they're all plumped up! And in case you're not quite convinced on the whole making-your-nutmilk vs. buying…trust me when I say that you'll be tempted to never go back to the carton! You’ll avoid the additives and stabilizers added to many of the carton versions; and homemade versions contain much more almond than the standard store bought variety (some of which only contain ~2% almonds)! All you need is a blender and a way to strain the milk after blending. A cheese cloth would work, but I highly suggest you do yourself a favor and buy a nut milk bag if you can. It's the best $5 I ever spent and lasts for years. The rose flavor comes from rose water, which is a product commonly used in Persian and Middle Eastern Cuisine. 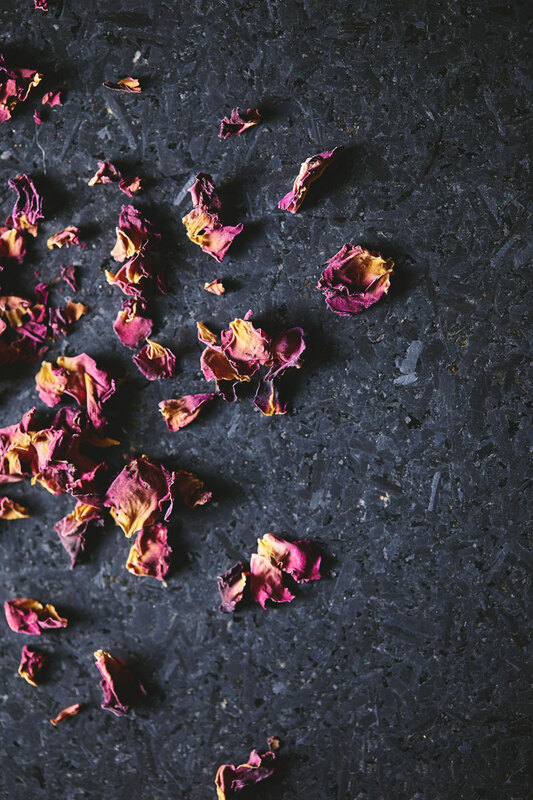 It's created through the process of steam distilling fresh rose petals. I watched a lot of YouTube videos on homemade rosewater (this one in particular), but after a few unsuccessful phone calls trying to track down organic roses, I caved and bought a bottle instead. Luckily, a Persian store in my neighborhood had about a dozen different brands to choose from! The smell and taste is divine. Rose water is very inexpensive (a few bucks at most) and even doubles as an inexpensive mist for your skin (take that, Sephora)! When buying rose water, look for a high-quality one without additives. Try to avoid the ones made from water and concentrated rose flavor – and funny enough, the price difference is marginal or non-existent. For a bit of extra pizzazz I added dried rose petals for a light pink hue. Naturally, of course. But if you don't have any on hand, you can feel free to leave them out. Your milk will still taste delicious (it'll just be white instead of a very light pink). I don't usually add much sweetener to my nut milk, but in this case, I'd almost go as far as to say that the honey is mandatory. It turns this nut milk into a luscious beverage – one that could satisfy your craving for sweets without needing to indulge in a full-blown dessert. Try to pick a mild tasting honey since a really dark, intensely flavored honey might compete (rather than complement) the rose. And the options for this milk are endless. I mostly sip it straight (I crave it, often), but it's also great in smoothies and tea! If you give this recipe a try, I'd love to hear your ideas on how else to use it! After soaking, rinse almonds thoroughly. Place almonds, honey, water, honey, rose water, and rose petals (if using) into a blender. Blend until the nuts are fully pulverized. Pour through a nutmilk bag (or cheese cloth) positioned over a large bowl. Squeeze thoroughly to strain out all the liquid. Transfer to a bottle or jar and refrigerate. Shake well before drinking. -*Look for a high-quality rose water, without any added flavors. -**Feel free to omit – the only difference will be that your milk won't have a slightly rosy hue. If using, make sure they are food-grade rose petals (ideally organic, if possible). This recipe calls for the petals only, not buds.